Agent Pronto is a free service that helps home buyers and sellers find top real estate agents in their area. Not the typical SaaS business that I analyze, but I wanted to put something out there showing how other business models can benefit from content marketing. They make money by brokering relationships between home buyers or sellers and real estate agents, and business has been going very well. Since launching in 2010, RealHQ, the company behind Agent Pronto, has quietly built a company that now employs 37 people. Their competitors charge real estate agents for each lead (somebody who expressed interest in their service). Agent Pronto, however, charges real estate agents 25% of the commission they receive when a referred lead buys or sells a home with them. They are able to charge this premium because their leads are very high quality. All leads are pre-qualified by an account manager, they aren’t sold to multiple agents, and an agent only pays if the leads completes a deal. As a business, Agent Pronto needs home buyers and sellers to hand over their contact information, and they need real estate agents to pay for that information. They are now serving just about every metro area in the US and Canada, so they have the agent side of the market covered. If they want to grow beyond where they are now, they will need to focus on getting in front of more buyers and sellers. Agent Pronto got to this point by focusing on pay-per-click (PPC) advertising, primarily on Google’s AdWords platform. Many people complain about AdWords because of the seemingly high cost for each click, and while there can be stick shock, all that matters is whether or not a business can profit while paying those rates for each click. Since Agent Pronto is able to charge a premium for their leads, they have plenty of margin to work with and have made their AdWords campaigns very profitable, giving them a reliable stream of leads. 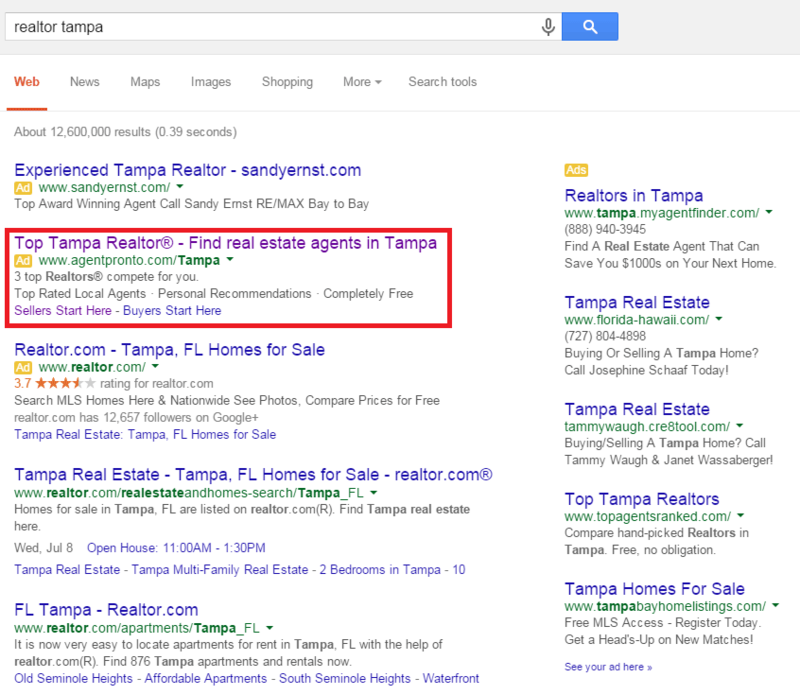 They advertise on terms like “Realtor Tampa” or “Cincinnati Realtors” and use those ads to drive close to 2,000 visitors a month to their site. These campaigns are performing very well as most ads are currently being shown in the top 3 spots on the search engine results page (SERP), so while further optimizations may be possible, there isn’t much room to grow. The problem with AdWords is that it isn’t very scalable. Even on keywords that are frequently searched for, only a small percent of that traffic will click on their ad. Agent Pronto currently has ads for over 5,000 different keywords. Not only have they picked the low hanging fruit, but there isn’t any fruit left at all on the AdWords tree. This got them where they are today so I’m not saying they should abandon it, but if they want to grow, they need to look at another channel. Since search traffic is converting so well for them, the obvious thought would be launching an SEO campaign and trying to rank organically for those keywords. 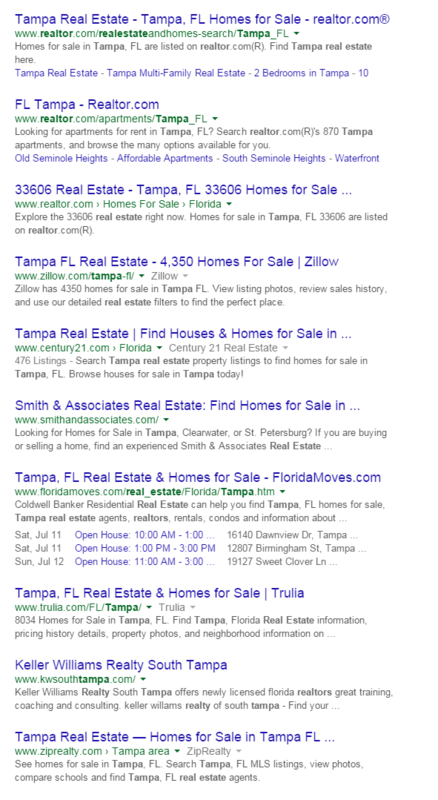 The problem is, if you look at the SERPs for those keywords, you’ll see that they are dominated by large sites like Realtor.com, Zillow, and Trulia, which will be very hard to beat. The other results are for actual real estate agents in the area, which Google will likely consider more relevant than Agent Pronto’s site. They shouldn’t ignore this strategy, but the gains won’t come easily. They currently rank 3rd for “real estate leads” which is great, but the buyers and sellers side of the equation is much harder to crack and that’s what the real growth is. If Agent Pronto wants to break through their current plateau, they need content marketing. Content marketing has been all the rage the past few years, and while it can produce transformative results for a business, it needs to be done right. For content marketing to work, it needs to be part of a bigger system. The center of any content marketing strategy is a blog. Agent Pronto should start by creating a blog on their site and featuring useful content for both buyers and sellers. I would suggest they start with a narrow focus most closely tied buying and selling homes, like “10 things every home buyer needs to know.” Once they cover the basics and know their audience better, they could expand into other related topics they know would get a good response. Unsurprisingly, the content itself gets all the focus in discussions about content marketing, and while it is obviously crucial, you need more than that if you want to succeed. To make content marketing work for your business, you need a way to build a deeper relationship with your audience, educate them on an issue that matters to them, and position your product as the best way to solve their problems. For Agent Pronto, the best way to do this is to create two free resources, “The Ultimate/Complete/Essential/Whatever Course for Buying Your New Home” and “The Ultimate Course Selling Your Home.” In exchange for an email address, they will send out the course as a series of emails that covers all of the topics and information buyers and sellers should be aware of. The courses need to provide real, valuable advice that the readers can act on and benefit from even if they don’t use Agent Pronto. This isn’t a sales letter, it is a way to build a relationship with their target audience and help them solve a problem. What can buyers/sellers do ahead of time to make the whole process easier? What are the most common mistakes people make and how can those be avoided? What can a real estate agent offer somebody that they can’t do on their own? Do all real estate agents offer the same services? How can they know they’ve found the right agent? Agent Pronto has worked with thousands of agents around the US and Canada and has unique insight into the problems that buyers and sellers face. If they tap into that expertise, they can produce an email course that truly helps buyers and sellers navigate the entire process. If you’ve gone through buying or selling a home, you know that is a huge, stressful process. Having an expert you can trust to help you get through the process and avoid making mistakes is invaluable, and that is just what Agent Pronto can provide. While it isn’t a sales letter, the course should still include a few pitches to get the readers to sign up for the service. Provide value first by explaining how they can make the process easier. Then show them how a real estate agent can help, highlight how hard it can be to find a trusted real estate agent, and then explain that Agent Pronto can help them do just that for free. Agent Pronto is a great service that truly helps connect people with top agents, and they owe it to their readers to let them know how they can help. If this is done properly, it will be a powerful lead generating machine. You need a way to convert readers into customers, which the email course provides, but you also need a way to get those readers to your site to begin with. “Epic” content alone is not enough to attract an audience. The good news is that Facebook ads make this a pretty simple process. To make their platform attractive to advertisers, Facebook analyzed huge amounts of data on their users and made the results available to advertisers so that they can precisely target their desired audience. The most interesting piece of data for Agent Pronto is under “Behaviors.” Here they can target Facebook users that, based on thousands of data points, are considered most “likely to move” in the near future. If they want to be more precise with their ad copy, they could layer an interest on such as DIY, and then use a headline like “Looking for the perfect fixer upper? Don’t make these mistakes.” There are a ton of options here. With this targeting in place, they should promote new blog posts to get readers on their site. Once there, every blog post should have a call to action within it as well as a popup offer, both to get readers to sign up for the ultimate courses. But that’s not enough. Agent Pronto should install a powerful tool on their website, Facebook’s custom audience pixel. This allows them to show ads only to people who have visited their site. Because these people are already familiar with the Agent Pronto brand, they can be asked to take the next step by using these ads to promote the ultimate courses. This process acts as a loop moving readers one step closer to signing up with each ad, and it can be repeated for every new blog post. I just laid out a complete content marketing system that could dramatically grow Agent Pronto’s business. It’s not complex, but to implement it does take a lot of time and effort. It requires interviewing buyers, sellers, and agents, researching new topics, writing, and editing. And to maximize the impact, the blog needs to be regularly updated with new content, so it’s not a one-time project. But the efforts are more than worth it. AdWords is ultra-competitive, and they built a real business on its back which is a great accomplishment. But they have maxed out what they can get from that channel and if they want to take the business to the next level, they need to develop another channel to acquire more leads. The content marketing system I’ve laid out is just what they need and if they devote the time to getting it setup and running, they can do just that. Could your business benefit from a system like this? If your business could benefit from a system like this but you aren’t sure where to start, I can help. In my Marketing Blueprint service, I analyze how you currently acquire customers, check out the competition to find your positioning in the market, figure out what problems are important for your customers, and create a detailed outline of a marketing system that would help your business get more customers. If this sounds like it could help your business grow, then a Marketing Blueprint is for you.